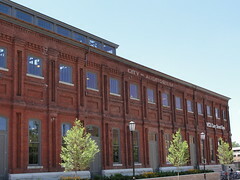 The Cary St Gym occupies the old City Auditorium building. The gym provides an excellent facility for students to exercise with over 178,000 square feet of space. Renovated and constructed to meet LEED Silver standards for sustainability. Paints, coatings, carpet and composite wood materials are low emission products of materials used for the gym were post and pre-consumer recycled products. The gym conserves more than 1.3 million gallons of water annually due to the duel flushing toilet system. 20% of construction materials were manufactured regionally (within 500 miles). 2-6,000 gallon cisterns to collect rainwater for use in irrigation. VCU purchased green power amounting to 35% of the power consumed by the gym over the first 2 years of operation. Over 90% of construction waste was sent to recycling. More than 70% of the wood used is certified by Forest Stewardship Council. Cleaning products are selected to ensure low emissions and reduce harmful runoff. Water bottle filling stations reduce the need for disposable water bottles.